January 23rd, 2017 – The low temperatures recorded during the cold snap over Europe in recent days have influenced the gas and electricity demands which have reached values that exceed the highs recorded in recent years. These increases in demand have had an impact on energy markets that have experienced significant price increases and have far exceeded forecasts. The Siberian cold snap that covered Eastern Europe this previous week arrived in the Iberian Peninsula last Wednesday 18th. The thermometers were more than 6°C below the typical temperatures on these dates. Compared to the last cold snap in the peninsula, in the winter of 2012, temperatures were similar; however, they remained low for more days. The low temperatures have led to a notable increase in electricity and gas demand, with recorded volumes that had not been seen since 2012. The peak of instant electrical power was recorded on Wednesday 18th at 20:20 with 4117 MW, and the day with greatest consumption during this snap was Thursday 19th with 847 GWh. Regarding gas demand, the maximum daily gas consumption this winter has been 1590 GWh, recorded on Thursday January 19th. 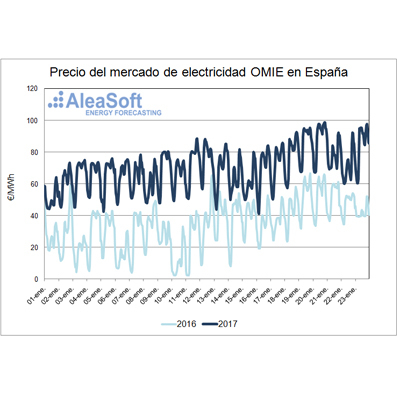 Coinciding with the increase in electricity demand, the price of the wholesale electricity market in Spain and Portugal operated by OMIE has registered very important increases, even more noticeable if compared to those recorded in the same month in 2016. The big differences with January 2016 have mainly a meteorological cause: the winter of 2016 was a rainy winter; the hydroelectric plants with fuller reservoirs could produce electricity at lower prices, whereas this year, the reserves are at a minimum. Furthermore, wind power by this time in 2016 already accumulated a 40% more production than this year. In addition to the weather conditions, the situation of the French nuclear power plants which has shutdown half of its reactors has pushed up electricity exports to France and also the market price. 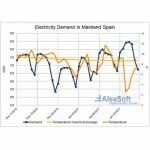 With regards to the consequences of the cold snap during the days of increasing demand, from Wednesday 18th to Friday 20th, the market price was on average 12.10 €/MWh more expensive than the same days of the previous week, with a maximum hourly price bordering 100 €/MWh, but finally stayed at 98.69 €/MWh on Friday 20th between 19:00 and 20:00. It should be noted that the 100 €/MWh price had not been seen in the OMIE market since December 2013, except for two isolated hours in February and March 2014, and that that price increase triggered the government’s suspension of CESUR auctions. Now the government has also reacted by announcing reforms in the gas market MIBGAS to force large companies to offer more gas to increase market liquidity and to lower the price, with the intention of lowering the gas offers of combined cycle gas plants in the electricity market. The main causes of this price increase are both the increase of demand in Spain and the increase of exports to France in order to cover the rise in demand of the neighboring country. This increase in demand is being covered by coal and gas production. The offers of coal-fired power stations, which are somewhat cheaper than the offers of gas-fired combined-cycle plants, enter earlier in the electricity mix, but they are not enough to meet all of the demand so the offers of combined cycles are also matched in the market. Hydroelectric power plants must also be taken into account, because, with reservoirs at a minimum level and being such a scarce resource at the moment, they offer their production at a more expensive price than usual for this technology. 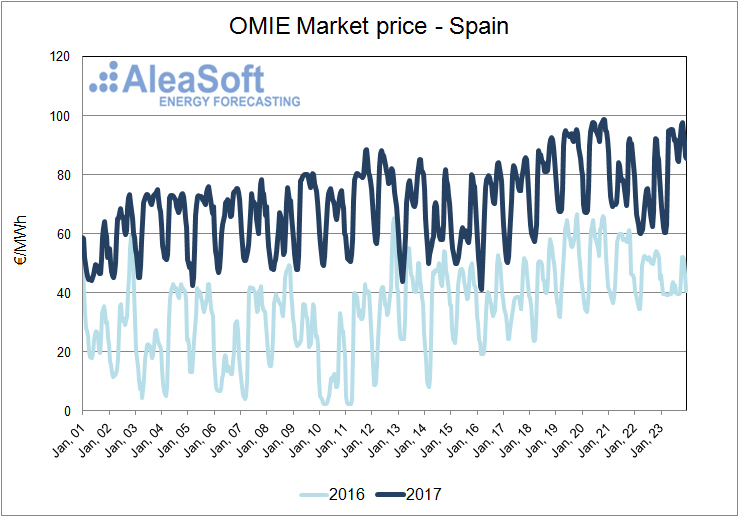 OMIE-Spain market price at the beginning of this year compared to the beginning of 2016. In other European markets, in countries that have also suffered from the cold snap there have also been significant price rises. 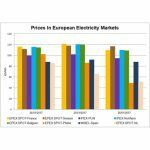 Germany was the first country in Western Europe to notice the drop in temperatures, the EPEX SPOT market in that country recorded significant price increases on Monday 16th. 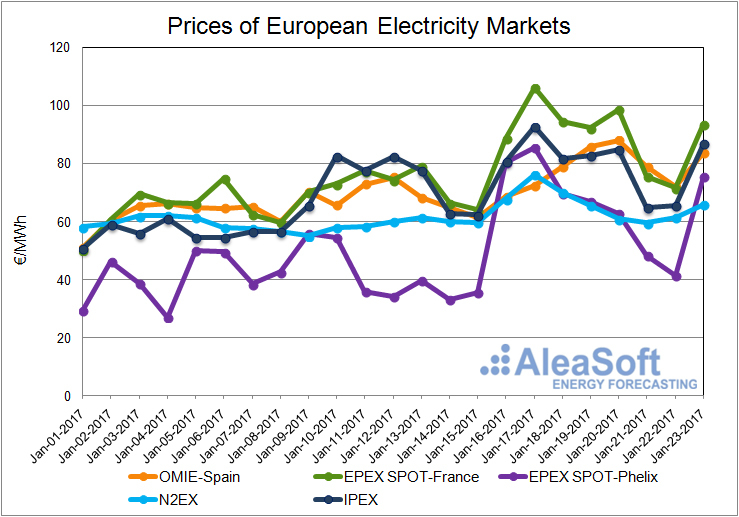 On the other hand, the EPEX SPOT market in France registered its maximum price on Tuesday 17th, above 100 €/MWh, coinciding with the most important drop in temperature in that country. The delicate state of the French electrical system, still with many nuclear power plants shutdown and with very little margin to safely cover the demand, has turned to import electricity from neighboring countries, which has also made the price of these countries that export energy more expensive. For example, markets such as N2EX in the United Kingdom and IPEX in Italy, where temperatures had already started to rise, also recorded their maximum price on Tuesday 17th influenced by the rise in France. In Spain, the price increase came somewhat later, being the last country to receive the cold snap and being less interconnected to rest of the European markets. Data sources: EPEX SPOT-France – EPEX SPOT, EPEX SPOT Phelix – EPEX SPOT, N2EX – NORD POOL, IPEX – GME, OMIE – OMIE. The prices of the N2EX market are expressed in €/MWh, calculated from the original values in £/MWh.